This is ALL I meant to buy when I looked at the site. 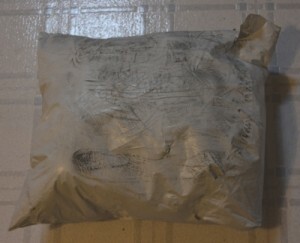 The package arrived today. It looked bigger than those two neat balls of Ella rae Classic navy yarn needed. Also looked beat-up, with tracks where something with narrow tired ran across it. It looked bigger because somehow, between going to the site to buy "just two balls" of navy yarn, "enough to finish the Red, White, and Blue socks" and handing over the wherewithal to pay for them, the yarn on the pages spoke to me. Maybe, it whispered, the Ella rae yarn isn't a true navy. Maybe the Cascade 220 navy is a better navy. And maybe that other dark blue yarn is even better. Maybe you should try all three. You know you like blue yarns, and you don't have any other good dark blue yarn since you used up all that Bernat "Sesame" from your mother's stash. It wouldn't be a waste, the ones you don't use in this pair of socks. You have other socks to make. 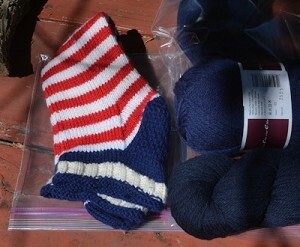 Think of one of the dark blues striped with dark green, a nice winter sock. Photographed in the kitchen, by mixed artificial lights, in late afternoon--only the royal blue is really the color it is. Eleven pairs of socks can be knit from this collection (two skeins or balls per pair. 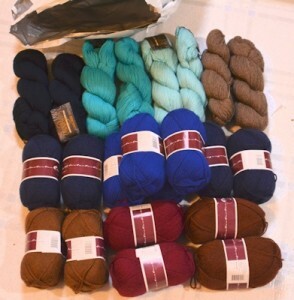 Not counting the leftovers that will go into other socks or mitts or hats or scarves or something. I have a nice collection of greens in another place. Lots of bright red. Some lovely deep rose flecked with other colors. I probably have five years' worth of knitting, at my usual leisurely pace, and maybe more, in the stash, with some still not excavated of my mother's. It's all bagged now in new Ziploc bags. The Red, White, and Blue project was moved earlier this week into second place (may end up as a travel project to/from DragonCon) and a friend's pair has moved forward--using an earlier purchase of the medium brown heather (Cascade 220 "Walnut Heather") on the upper right in this photo. 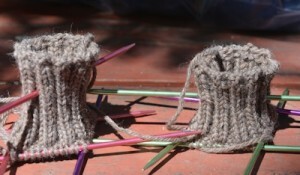 It was cast on yesterday, the ribbing on both socks already more than an inch. Tomorrow, in late-morning/midday daylight, I'll pick the navy for the RW&B socks, and put those balls into the right project bags. Yarn is seductive in so many ways. The colors. The feel of it. Most of all the endless possibilities, both for single yarns and for different combinations. It reminds me of when, as a child, I fell in love with dictionaries...all those words. All those words, and their histories, and the way meanings shifted around them as colors shift a little when placed next to other colors. I wanted all the words in my head (they aren't, of course) and I wanted to play with them--their sounds, their flavors, their meanings and the way "blue and white" evoked a different mental image "white and blue," the inertial power of assonance and rhyme and on and on. Yarn is tickling the same itch in my brain now. Color's always been important to me, and yarn--more in socks than in other garments, at least for now--lets me play with colors in a way that other things haven't. I never enjoyed sewing, though I did some, so quilting--beautiful as it is--wasn't going to be my thing. I should go knit now. Work my way through another two balls, for my friend's socks, finish up the RW&B socks, knit the replacements for the turquoise pair and the purple pair that wore out (or are about to wear out. So far this year I've finished seven pairs of regular socks, six pairs of short ones, and plan another four. regulars. EDIT Image added Aug 7. Trying to match color to a 50 year old yarn...I took one of the 4th of July socks out side along with the candidates for the match, and laid them down in the full, HOT midday August sun. Indoors, all the dark blues (including the old Sesame yarn I used in the socks) look almost black to me. Brighter light, clearer distinctions. Ella rae Classic Navy (#85) wins, though not a perfect match. That's probably as close as you can come, especially trying to do so from online color swatches. Murphy's law being what it is, probably I'll find a spare skein of the old yarn in a yet-unexplored-box two days after I finish the Red, White, and Blue pair. 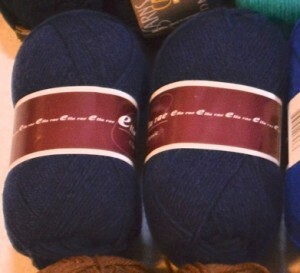 It turns out that I did not buy three different dark blue yarns,two 100g lumps of each...I bought four balls of the Ella rae in the same color. Either I did it by accident, or I forgot I did it on purpose, but it doesn't really matter. The darker, more "bitter" Cascade 220 navy is a welcome addition to the stash and will find its right use later. I am like this with beads. "Oh, I just need the tiger's eye--oh, that tiger iron looks nice too. Those crystals will add some sparkle. Ooh, turquoise skulls! Well, Halloween is coming, so..."
Probably everyone has at least one such passion. "Yarn is seductive in so many ways." I don't even knit or crochet and I have a few small balls of yarn. You know, soft and pretty and soft and it FEELS nice. But I am not a maker, although I have tried both knitting and crocheting. Just not my thing. Have you considered weaving? Or, just to play with the softest part of the whole woolly obsession, spinning? Though it's perfectly OK to just fondle yarn and enjoy it. I think I'll stay with fondling and enjoying yarn and reading about your knitting adventures. One can also felt, which creates its own magic transformation. Giggling madly - how I identify with that. Plus I, too, have inherited my mother's stash - she is still very much with us, but has had to give up knitting because of arthritis, and has been doing a mega-declutter prior to moving from their home of 58 years.... yes, horribly sad; they are downsizing as they need to be near their neighbours, and specifically my brother. The latter builds mansions for his wives (I'm being snide; he's only had two! ), and has moved into the latest, and my parents are moving into his old, temporary house. I still have more of my mother's stash to explore, but I need to figure out a way to get things in better order here before I open another of her boxes. (Or--ahem--buy more yarn.) She had packing algorithms NASA or ESA would have envied, and every time I open a box she packed, I can't get it back together. She said it came from living for several years in an 18 foot trailer back during the Depression--she could put more into a tiny space, organized, and take out and put back without mess, than anyone else I've ever known. I had to knit two pairs of socks out of the box I opened before I could get the top back on properly. I'm sorry your mother had to quit knitting (and am aware that is likely to happen to me--either vision loss or arthritis or both) and feel for them having to move out of their home. I hope that some day in the far distant future when they come to clean out your house they do not find a ton of unused wool. The Emelda Marcos of balls of wool. Not being manually dexterous I appreciate your abilities. I also understand that knitting can be therapeutic.